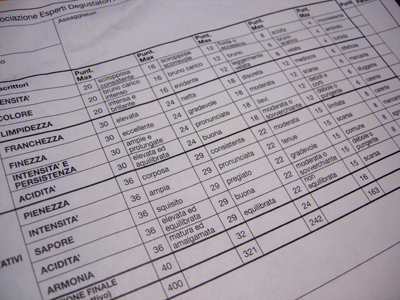 A cura dell’Associazione Esperti Degustatori degustazione guidata di sette aceti balsamici tradizionali di Modena per imparare a comprenderne pregi e carpirne i segreti. Assaggio di campioni di differente invecchiamento: 8 anni (in maturazione), 12 anni (affinato), 25 anni (extravecchio) e oltre (extravecchio riserva ed extravecchio gran riserva). A concludere due aceti caratterizzati dal legno delle botti di affinamento: extravecchio grand cru in ginepro e in ciliegio, entrambi di età superiore ai 25 anni. Finale con ricerca del miglior abbinamento con un parmigiano reggiano di oltre 30 mesi di stagionatura. 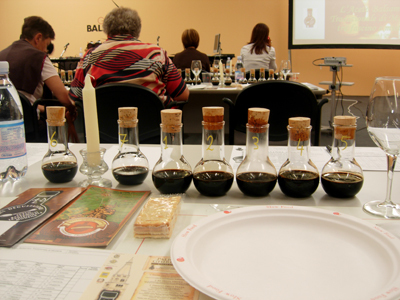 The Association of Expert Tasters present a tutored tasting session of 7 Tradition Balsamic Vinegars of Modena. The vinegars tasted will be 8 years, 12 years (Affinato/Fine), 25 years (Extravecchio/Extra Old), Extravecchio Reserve and Extravecchio Grand Reserve. To finish two wood influenced vinegars will be sampled: Extravecchio Grand Cru - one aged in Juniper and the other Cherry wood, both aged over 25 years. To finish we'll be tasting a Parmigiano Reggiano aged for more than 30 months. We all had one of these arrangements set up in front of us. Directly in front of us are flasks labelled 1 to 5 and these are the vinegars mentioned above, and they go from youngest to finest. 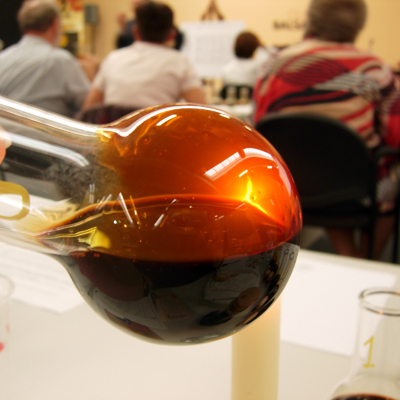 The whole basis of the class is to give us an understanding of Traditional Balsamic vinegars - how they are made and the criteria used to judge them. 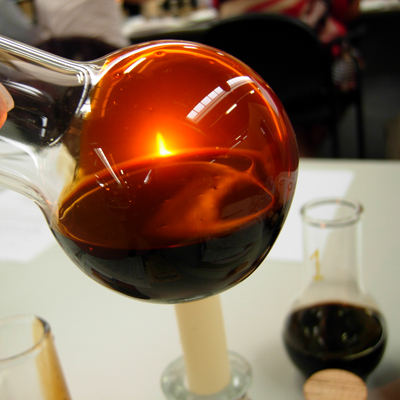 It's important to stress that we are talking only about Traditional Balsamic Vinegars. 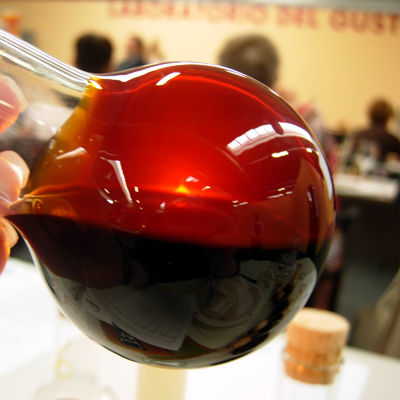 There are strict conditions in place that dictate even what bottle is used - you'll find the assessed traditional balsamic vinegar will always be in the same bottle. The bottle was especially designed by Giorgetto Giugiaro and can be only be used for this purpose. The colour must be a dark tawny brown and show the correct density for its age. The aroma will be a characteristic and complex scent, penetrating and obvious but with acidity in harmony. The flavour is sweet and sour in balance, full but with complexity and should fulfil the olfactory sensations ascribed above. 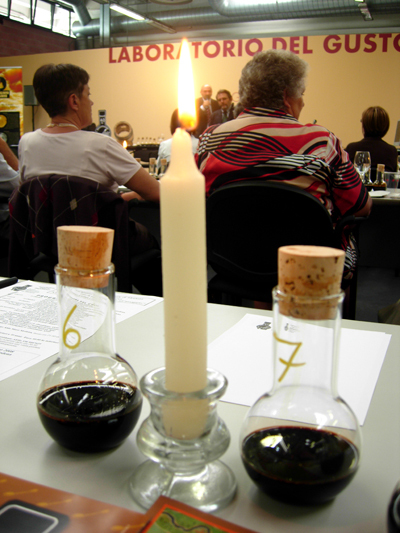 Aroma is given 120 points, 30 points scored equally between Openness, Refinement, Intensity & Persistence and Acidity. Flavour is given 180 points, 36 points scored equally between Fullness, Intensity, Taste, Acidity and Harmony. Finally a score out of 40 is given for your overall impression as a whole. Apart of the last score all the other judgements are analytically based, it's in this last score that the subjective enters the equation. This is what the scoring sheets look like. The association also issues a price guide - the affinato starts from €45 and the extraveccho from €75. No onto the tasting - amusingly we don't taste from flask 1, we move straight onto flask 2. 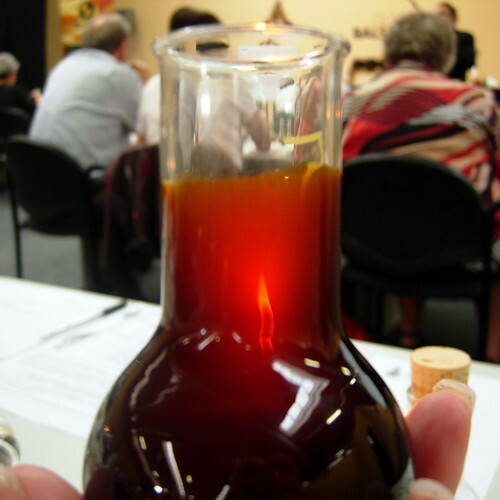 With a minimum age of 12 years, this vinegar scored 229 points when judged. It is labelled Affinato (Fine). The process we used is exactly how the official tasters would do it. You swirl the vinegar around the flask and then tilt it as you use the light from the candle to help you access it's density colour and clarity. The next step is to coat the neck of the flask and then draw it to your nose, breath in and then move the flask away. This is done a maximum of 4 times. The finer the vinegar the more you can breath it in without feeling the acidity pricking your nasal passages. Using a spoon, a small amount of vinegar is placed upon it and then you taste it, making sure it coats all of your mouth. We repeat this process with all the subsequent vinegars. Flask 4 - Extravecchio Riserva, scored 322+ points, once again, it's even thicker. This would be used to accompany some cheese, like parmigiano or just drunk on a spoon. 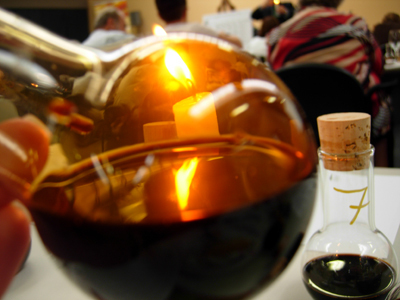 Much like you would sip a fine old cognac, you treat these special vinegars the same. 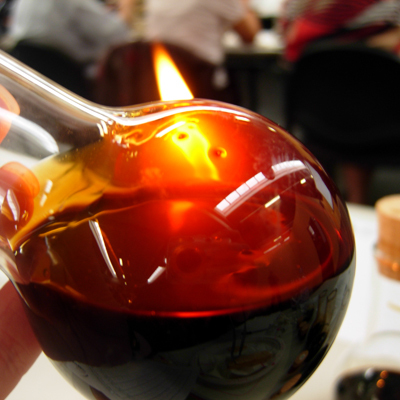 Flask 5 - Extravecchio Gran Riserva, scored 340+ points. Strictly something that you would drink on a spoon. Quite a unique experience and redefines the whole concept of vinegar. This shows the flasks 2-5 and you can clearly see the different densities. They have all been freshly reswirled and left to sit for the same time to give a more accurate picture. Our next two flasks were both Extravecchio Grand Cru - but one matured in Cherry wood and the other Juniper. 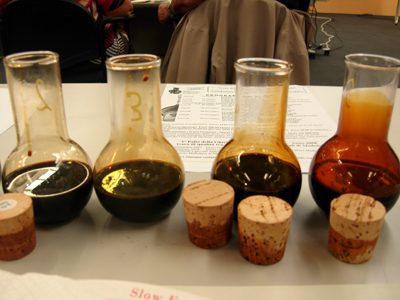 In tasting these we are shown the influence of wood on the vinegar. Flask 6 - Extravecchio Grand Cru Cherry Wood - the cherry wood imparts a much fruiter flavour to the vinegar and this is something you would use to drizzle over ice cream or have with your strawberries. Flask 7 - Extravecchio Grand Cru Juniper Wood - juniper is quite resinous and imparts a stronger flavour to the vinegar so this would be better suited to be served with meats and cheese. 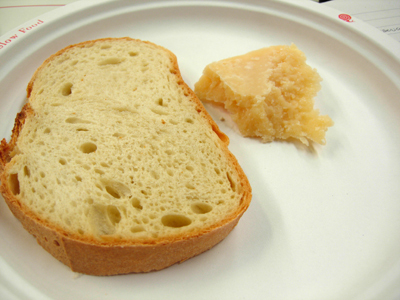 Final part of the workshop was the parmigiano reggiano. There's now a classification system for aging - a red seal means the cheese has aged at least 18 months, a silver seal means at least 22 months and a gold seal means at least 30 months. The piece we are tasting is a gold seal and was aged for 33 months. 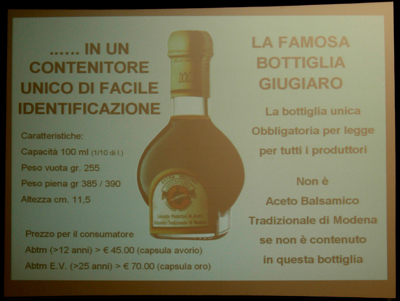 This was such a fascinating workshop and it really opened my eyes to what is a true traditional balsamic vinegar.